The work of the Survey of Western Palestine was completed in 1888 with a lengthy index of all subjects, places, and names in the maps and the three volumes of Memoirs, the Special Papers, the Jerusalem Volume, the Flora and Fauna of Palestine, and the Geological Survey. 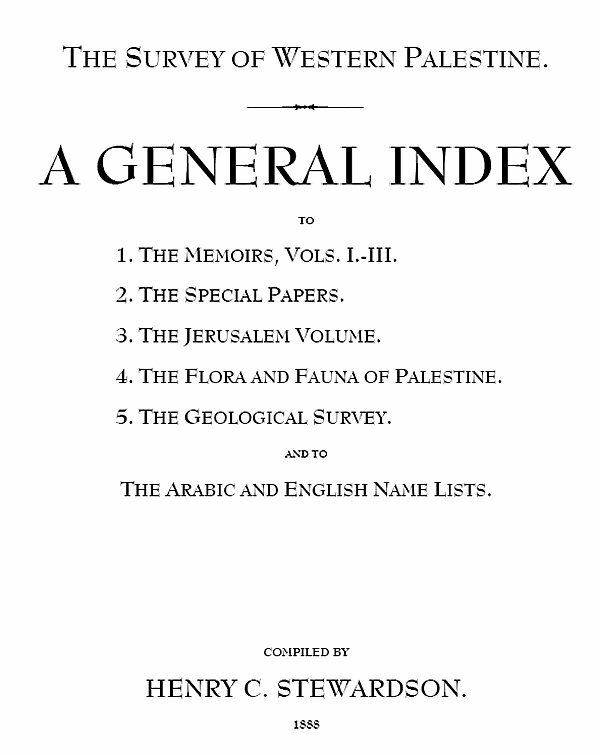 A separate index was prepared for the Arabic and English Name Lists. BiblePlaces.com has recently released the first-ever electronic edition of the complete index. The Index was originally compiled by Henry C. Stewardson and published in 1888. 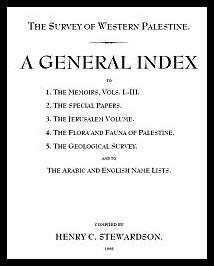 More recently, the Index has been republished by Archive Editions and sold as part of the Survey of Western Palestine collection for $4,795. The electronic edition of the Index has numerous advantages over the printed version. The electronic edition is neither rare nor expensive, but is freely available to all. In addition, the electronic edition may be easily searched, copied, and printed. The Index includes approximately 17,400 entries, a total of 165 pages. What are the advantages of an index without the complete set of volumes? First, some have access to the Survey of Western Palestine volumes in a local library and having their own electronic index facilitates use of those volumes. UPDATE: Many of the volumes may be downloaded for free. 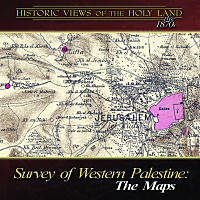 Second, the 26 maps of the SWP are now available electronically in the Historic Views of Holy Land collection. This Index is a useful companion to navigating those maps. Third, the name list is a handy way of determining the meaning of the Arabic place names. For instance, you can see that ’Ain Jidy [Ein Gedi] is "the spring of the kid" and Kh. el Meshâsh means "the ruin of the water-pits." Many of the names of the sites in Palestine in the 19th century are quite fascinating. Fourth, the general index often gives some helpful identifying information, especially for sites that have multiple names. For example, "Beisân (Sh. 9, Pk) represents the ancient Bethshean and the later Scythopolis," and "Bene Hazîr, the tomb of, traditionally called the grotto of St. James." Also, "Geba of Benjamin, the ancient, identical with Jebả," and "Shiloh is no doubt the ruin of Seilûn." Fifth, the Index may profitably open one’s eyes to the vast amount of research done by the early explorers of Palestine. Too often, their work has been neglected and mistakes made that would otherwise have been avoided with the knowledge that they had. Sixth, the Latin names of the flora is herein contained, providing easy access to the wide variety of flowers in this land. Seventh, if one were doing a study of certain features, this Index makes it easy to quickly compile a list of those with the name of wady, khirbet, tell, rujm, jebel, kefr, etc. Eighth, the Index provides ready information about historical geographical problems that continue to be difficult issues: "Emmaus, the, of the New Testament, is perhaps identical with ’Amwâs, III, 14; Robinson’s remarks thereon, 41; is traditionally identical with el Kubeibeh, 17; is possibly Kh. El Khamasa, 36; the origin of the name, ib. ; description of the proposed site, 38; Kŭlônieh proposed, 40; suggestion by Rev. W.F. Birch, ib." Alternately, searching for Hazor will lead one to multiple sites that were suggested as possibilities. One final comment on the value of the Index may be added. Sometimes, insight into the explorers' observations is given without going beyond the index, such as the entry for Jericho: "Erîha (Sh. 18), a miserable mud hamlet, appears to have been known to the crusaders as Jericho, III, 172; the inhabitants are very degraded, 232." The researcher should note that the original work has been preserved exactly, including all accent marks. Be aware, then, that a search for Silwan will not result in a match, but a search for Silwân will. Copyright Information: This electronic edition is copyrighted 2005 by Todd Bolen/BiblePlaces.com. Permission is granted to distribute this index electronically or in printed form if no charge is made for it and the credit information is not altered.